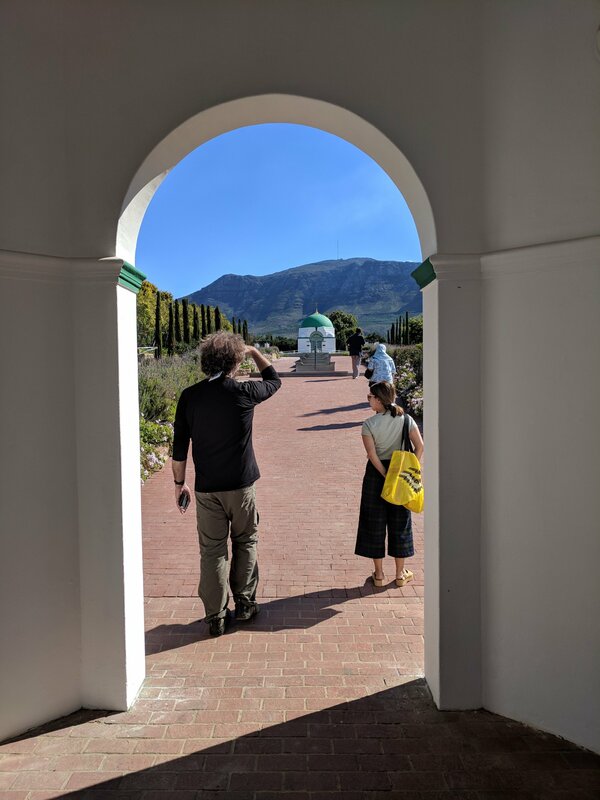 After spending Monday with an inspiring group of students at UCT taught by Kevin Fellingham and Nic Coetzer, most of Tuesday was spent with the vibrant husband and wife team Heinrich and Ilze Wolff. We started in their office in Bo-Kaap Cape Town’s historic Muslim district with its vividly painted houses. Sitting in a room with large windows to the street that operated as both gallery and meeting space they gave me a window into the ideas and projects that were occupying them. 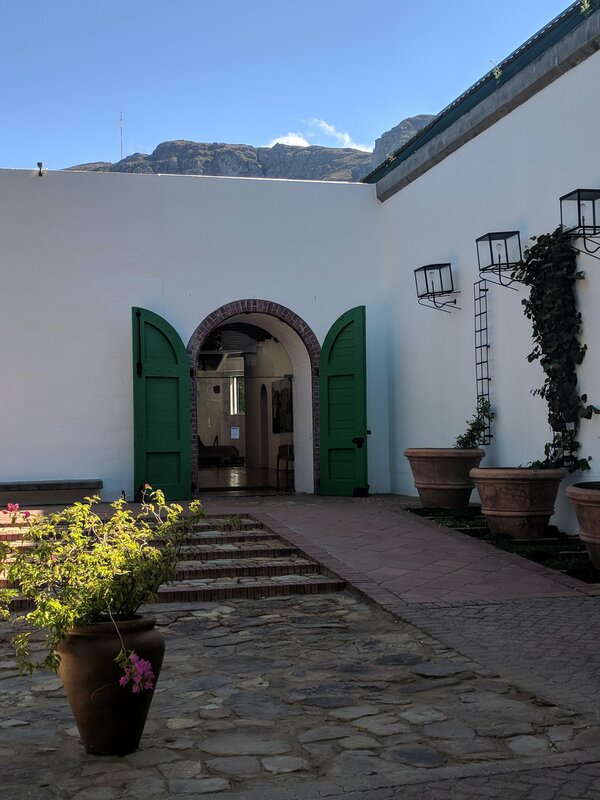 Their projects range from private houses, a hospital, an upcoming exhibition in Munich called African Mobilities, to new spaces for the humanities faculty of the University of Western Cape. As well as being the architects for the latter they are artists in residence alongside puppeteers and musicians, where they are drawn into discussions about the post-apartheid identity of the institution as much as the designs for the buildings in the rapidly transforming Woodstock on the industrial edge of the city. 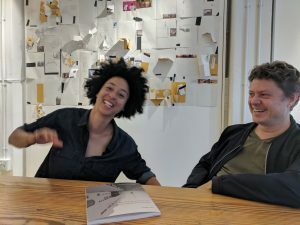 It quickly became evident that they are actively engaged with the context in which they are working, and have created initiatives with artists that offer a different lens through which to understand the city and therefore tackle it’s issues. 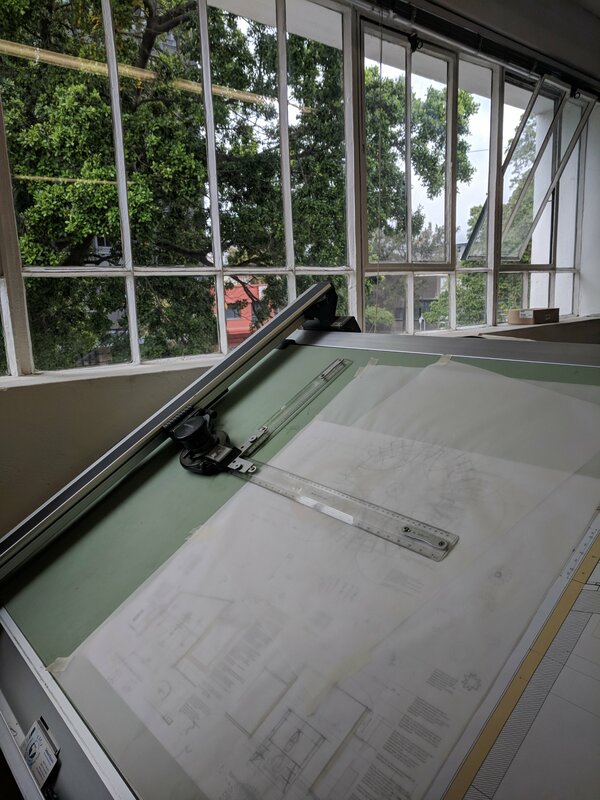 They want to reinstate architecture “back into public consciousness” and to interrogate the role architects might play in the future of a new, integrated South Africa. They have used the ground floor of their office as a gallery and event space to connect with a wider audience, often using photography as a means to re-visualise the city. 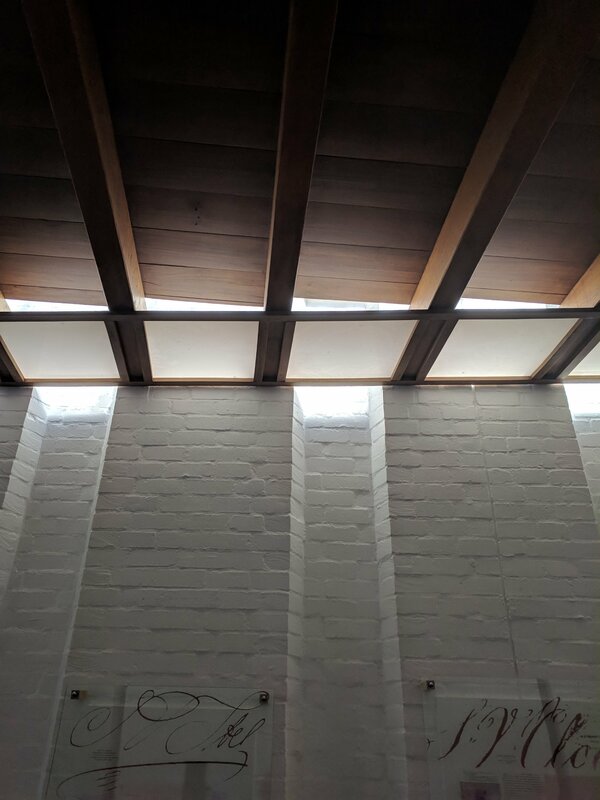 In subsequent conversations I have had with young architects in particular, it was cited as an important initiative in a place that seemed to only have a small public offer for architecture. This echoed my own experience during my week in Cape Town where I have been shown a surprising wealth of modernist architecture (see Instagram feed) that is little published in books or documented on the web. It was created in an apartheid era that complicates it’s reading but Ilze has started to promote this unique modernist legacy through Open House Cape Town where she organised a tour of 6 brilliant houses by Adele Naude Santos and Tony de Sousa Santos – bringing the couple together for the first time in over 20 years. The lack of documentation is even more the case they noted with Zulu or Debele architecture, of which there are no books which leads to ‘an impoverished culture of architecture’. 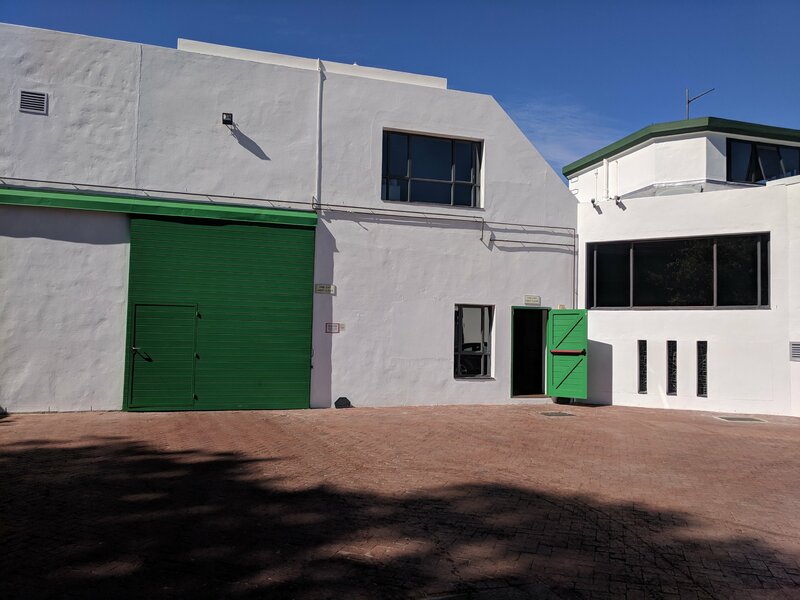 After a quick look around the office upstairs and Heinrich’s beautiful drawing board that took me back to my students days we jumped in the car and headed to the suburbs to their most recently completed Chere Botha school for SEN students in the Western Cape. 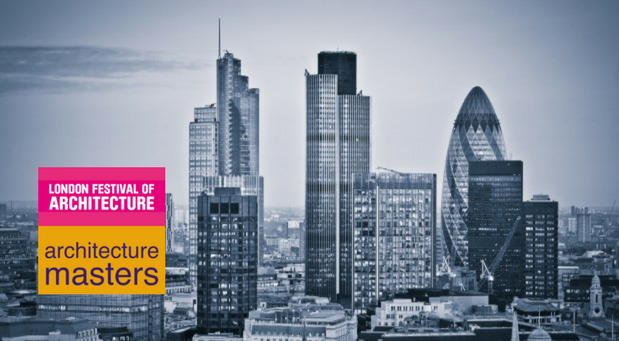 It was a local government initiative that took 7 years to develop the brief, find a site and deliver. 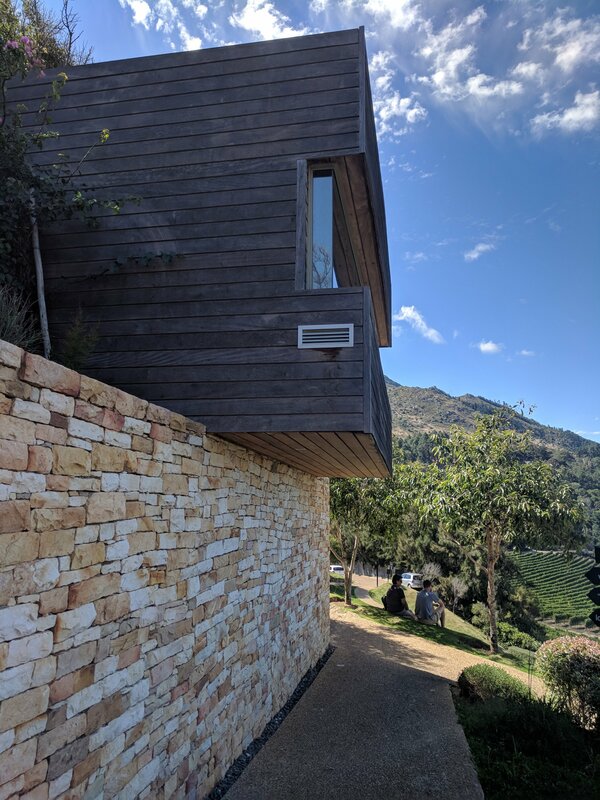 It had to meet strict cost and regulatory institutional requirements but the end product does not feel compromised, no doubt a result of the strong will and determination of the architects. As Heinrich said, it has a “serious public purpose, it doesn’t need to be invented by the architect”. 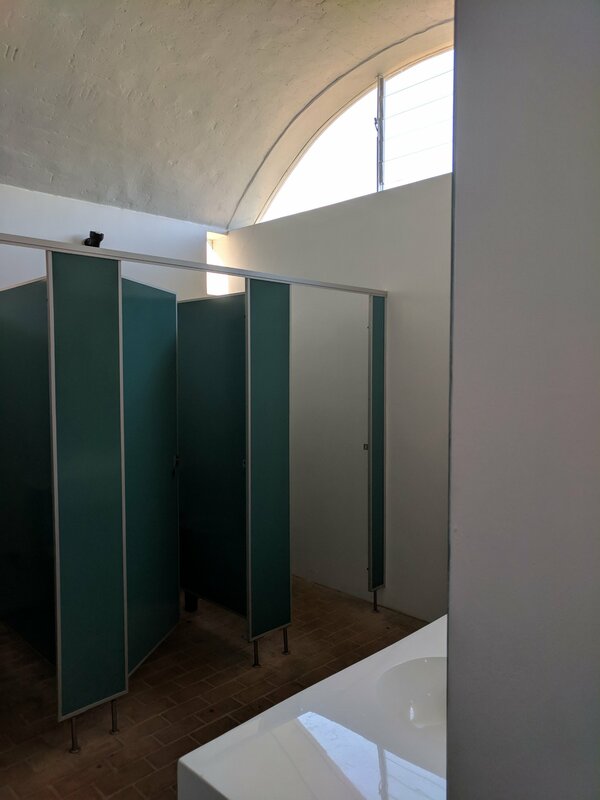 The students who attend the school have a range of learning difficulties and are sensitive to light, glare, colour that requires a muted building palette and ambient rather that direct daylight. The buildings create a large U-shape with a round drop-off and collection area for parents that is secure. 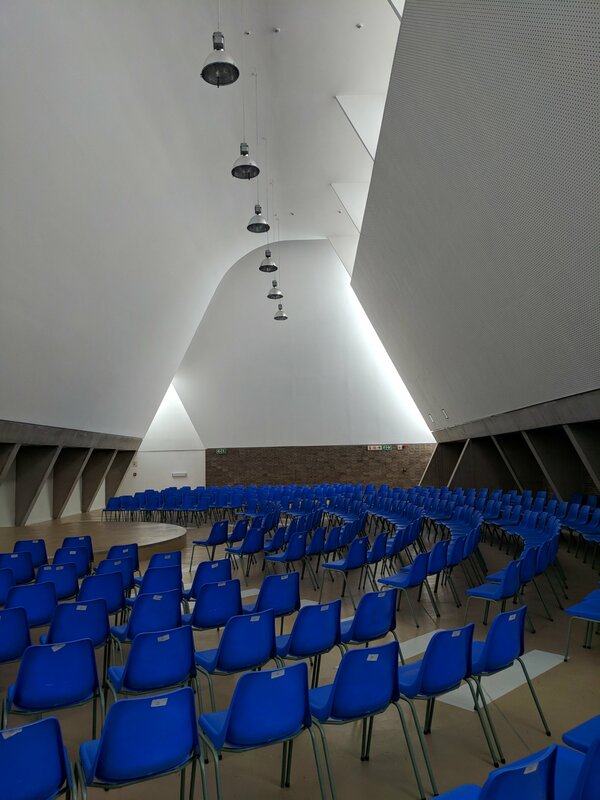 The main assembly area was top lit and beautifully shaped with stripped back and simple interiors. 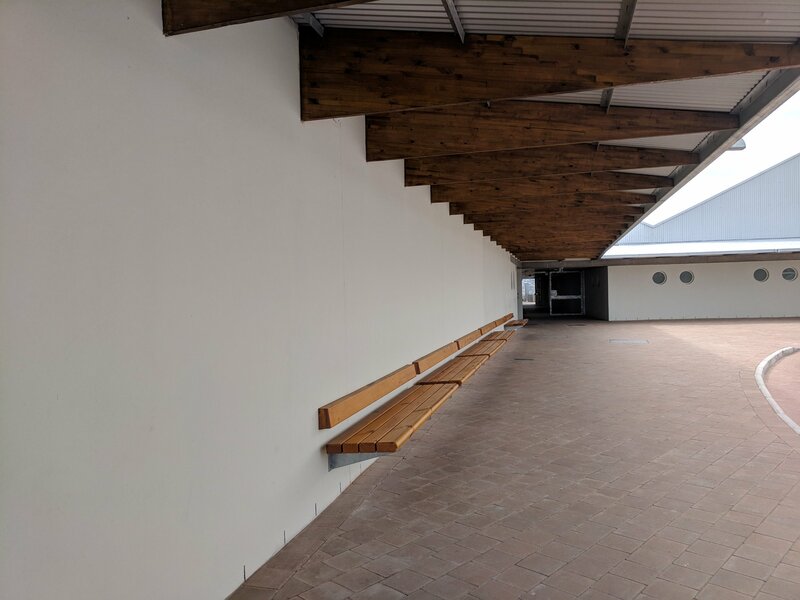 A-frame roofs open at either end, enclosed courtyards that were located between the classrooms offering a protected and safe space for the children to play that was filled with fresh air and light. 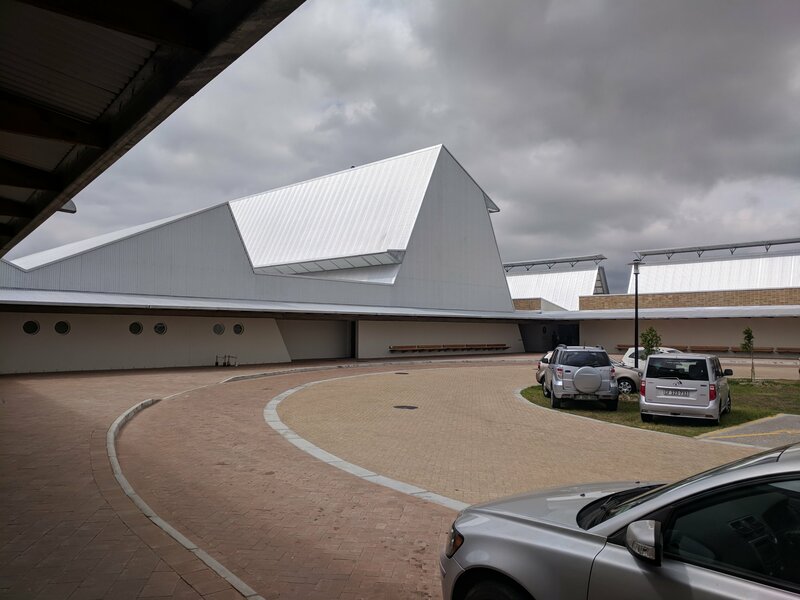 The dramatic roofs gave the building a dynamic form and showed it was anything but a standard government institution building. 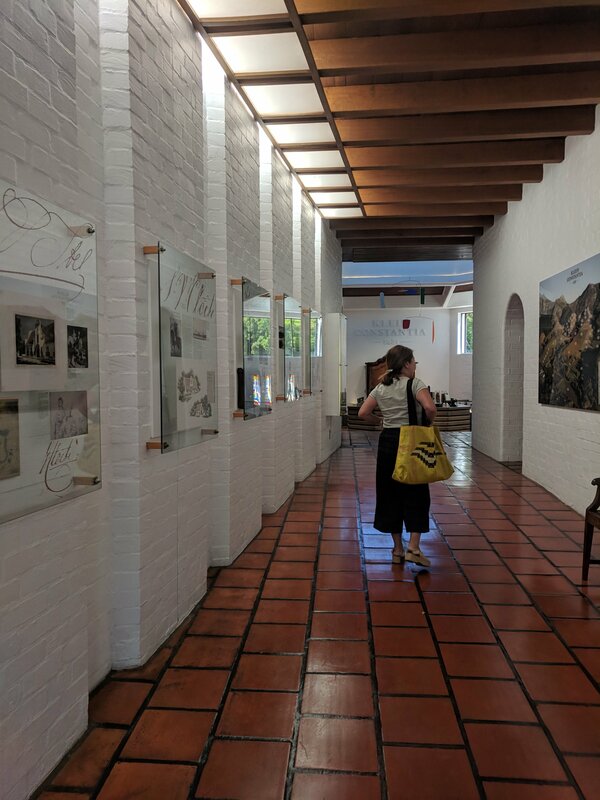 I had a gentle and much appreciated start to my explorations as I was met at Cape Town airport by architect and teacher Kevin Fellingham and his wife, curator Winnie Sze who whisked me off to Beau Constantia, a beautiful winery overlooking False Bay. I can think of no better way to get over jet lag than to have a glass of delicious South African white in hand, appreciating architecture in good company. 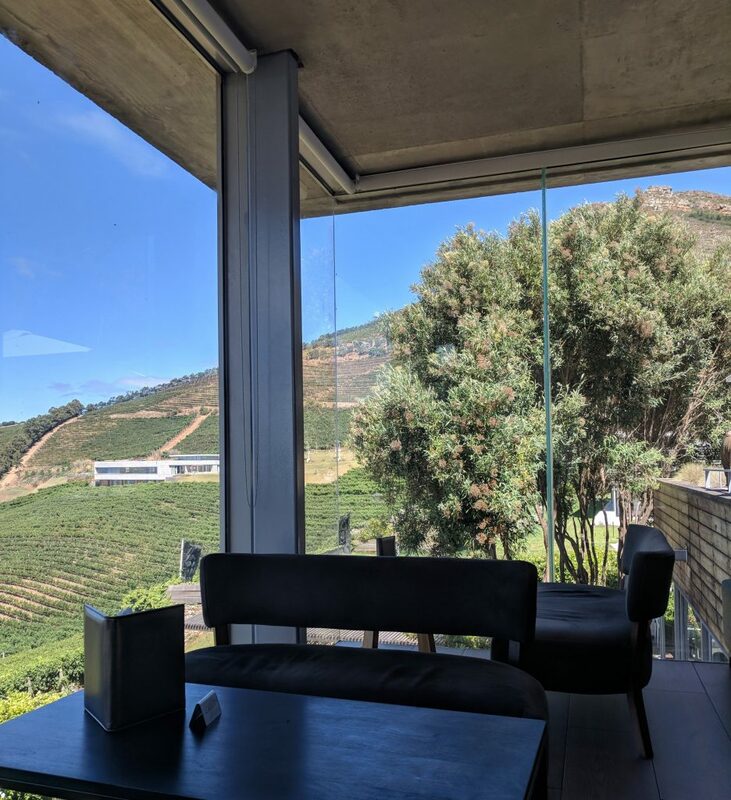 We sat in the tasting room a glass box atop one of a series of pavilions designed by Jon Jacobson that nestle into the hillside amongst the vineyards. 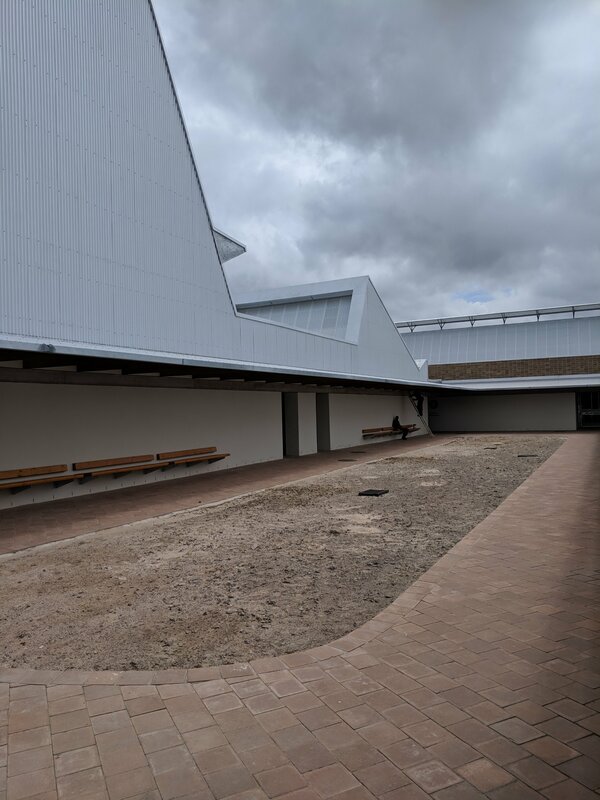 The siting of the pavilions, including a converted shipping container took advantage of the topography, creating a synergy between landscape and buildings. Windows framed views into the surrounding landscape – even the toilet pavilion (below) had a spectacular view over the valley with Stellenbosch in the far distance. 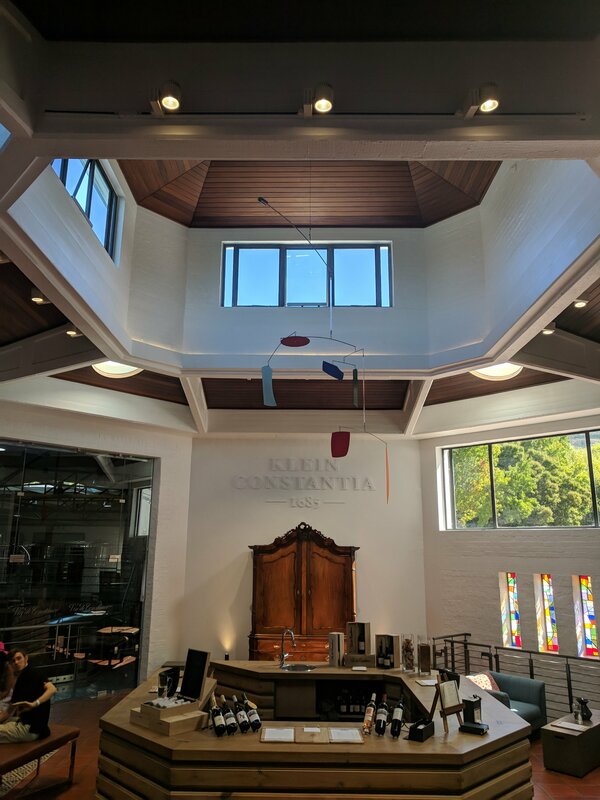 We then went on to Klein Constantia, yes, another winery, but at this one it was pure archi-appreciation. 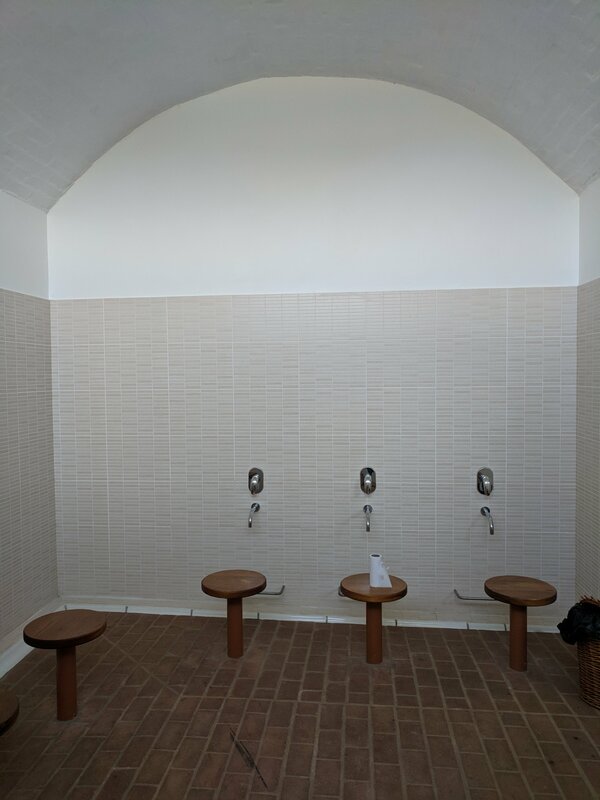 Gawie Fagan designed a cellar in 1986 just up the hill from the original Cape Dutch homestead. 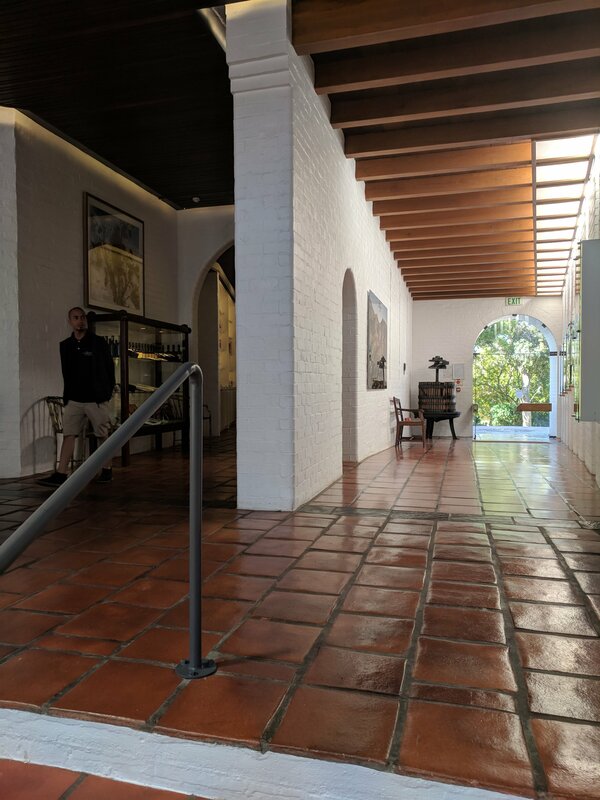 The building greets you with a wide upward-sloping entrance and gently lures you through a deep archway door and along a solidly built corridor with light filtering down the stepped, side-wall. 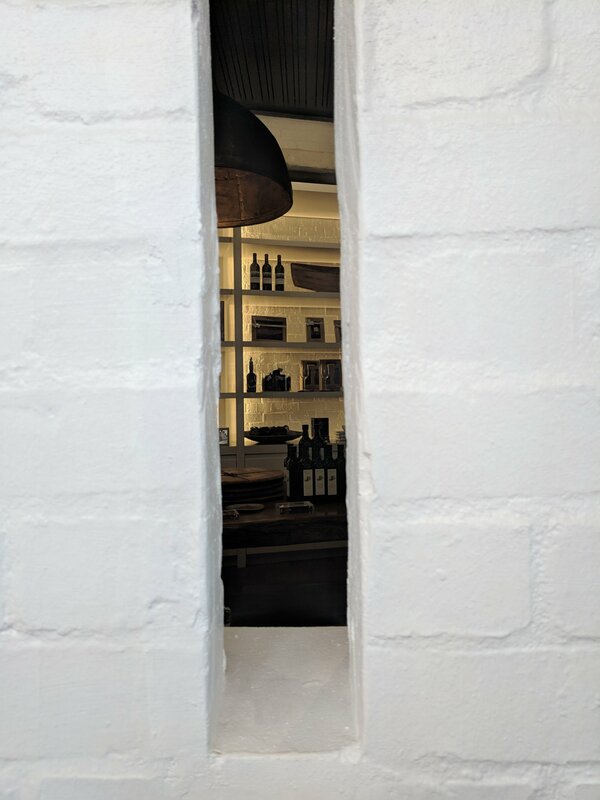 Lovely details are everywhere – slots in the wall glimpse to a parallel space now a shop, a flagstone in the tiled floor denotes a threshold into a top lit octagon space, and is a sign to look up and glimpse Table Mountain through a specially placed window high in the wall ahead. The simple form of the building can be appreciated when standing in the working yard to the back, with a parred-back facade. 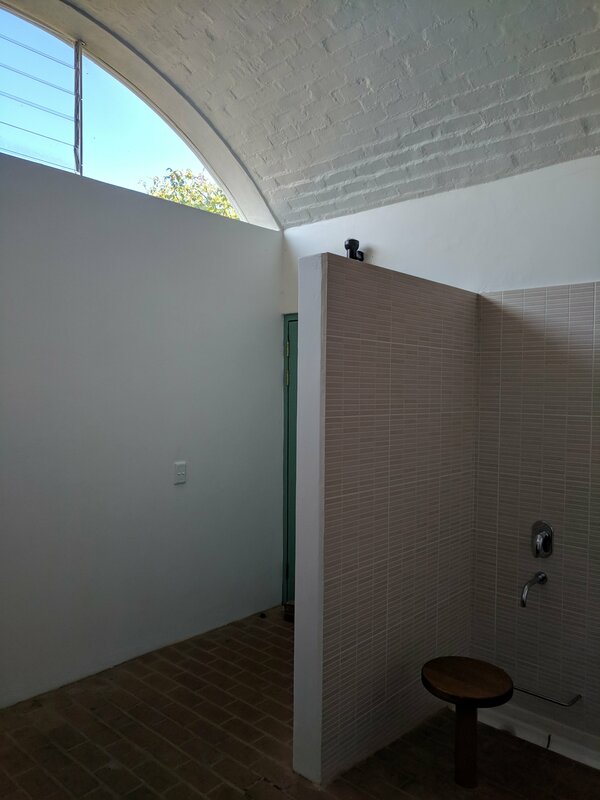 It feels like a farm building that has been given just enough intention to feel like architecture. 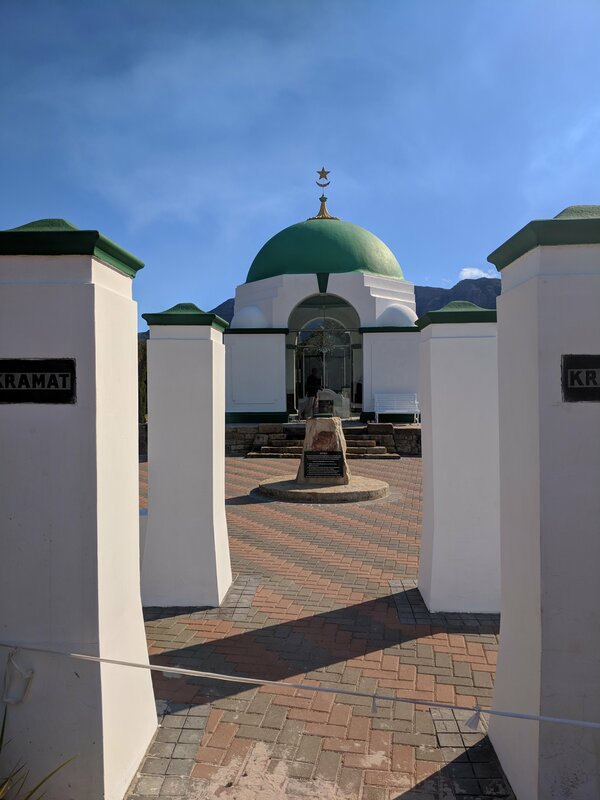 Down the hill sits the Kramta (Muslim shrines that mark the graves of Holy Men) of Sheik Abdurachman Matebe Shah who was one of the three teachers who brought Islam to southern Africa in the seventeenth century. 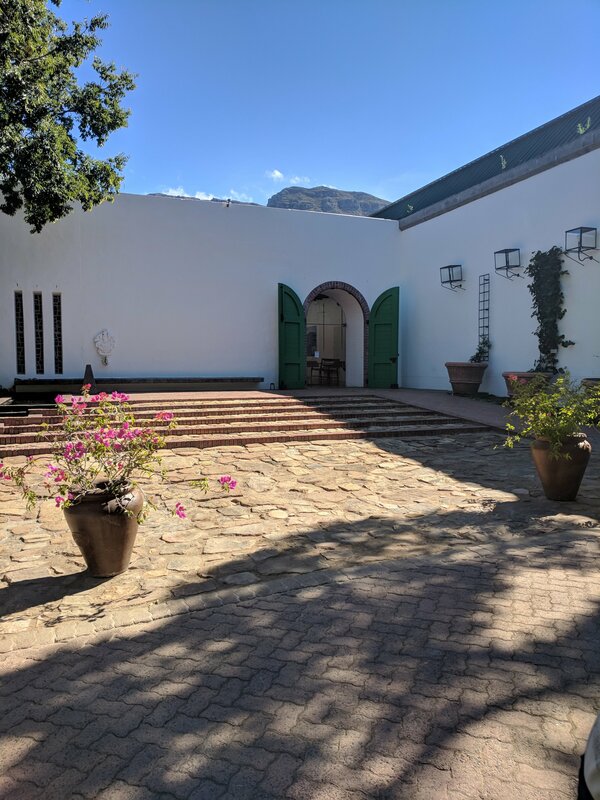 The more magical Kramat however was that of Sayed Mahmud, 10 minutes further along the road in Groot Constantia designed by Frank Flemming (a partner of Herbert Baker) with gardens and a washing block recently added by Gawie and Gwen Fagan. 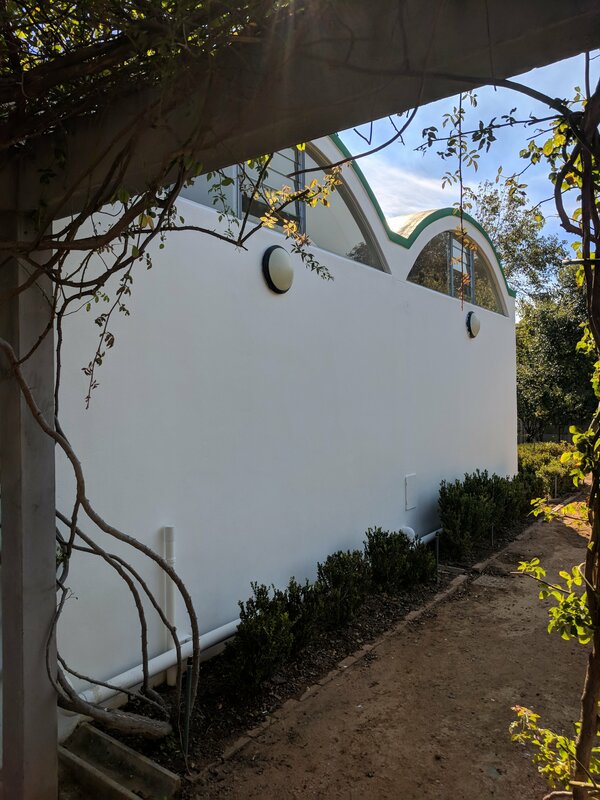 The whole place has an atmosphere of calm and peace – the shrine located at the vista of a gentle slope that encourages slow movement towards it. 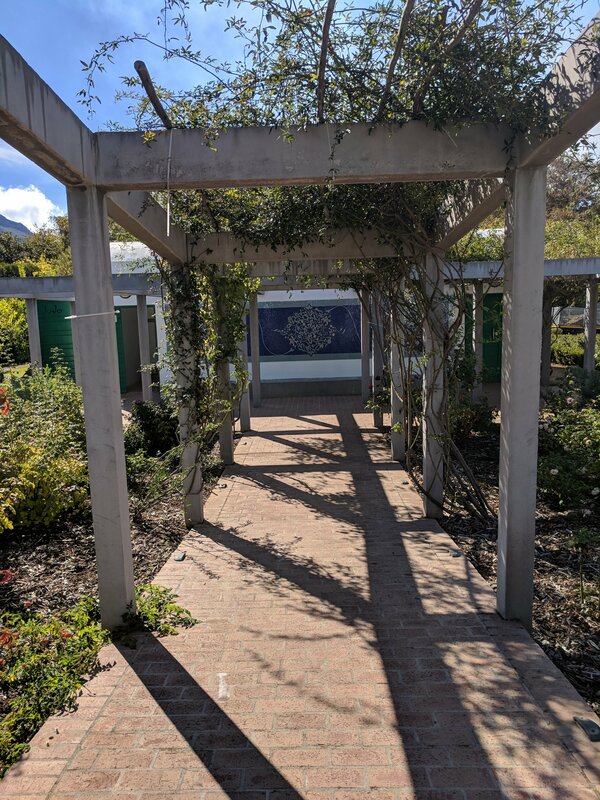 The washing building is reached via a simple but subtly joyous concrete pergola covered in vines. 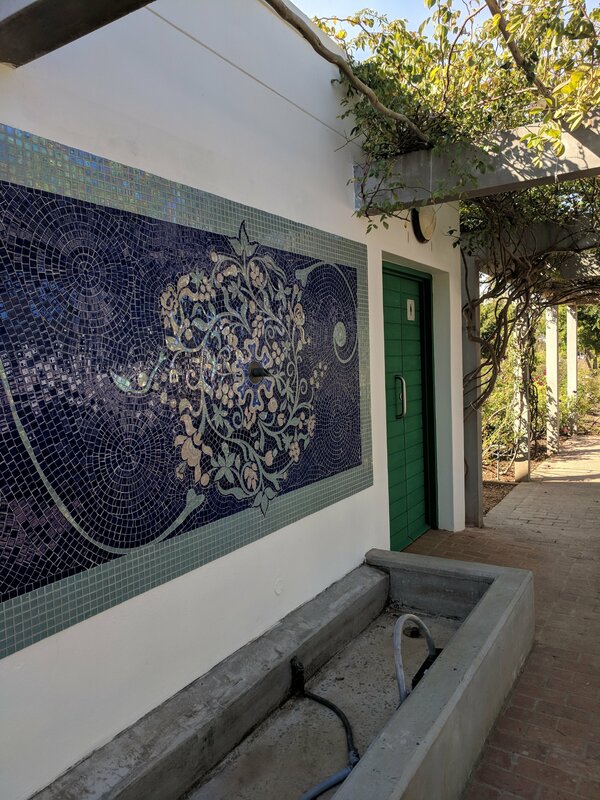 The long, facing wall of the washrooms, is adorned with a beautiful mosaic and the inside reveals one of the most serene spaces I have entered in a long time. conversations I have, the people I meet and the work I uncover, on this site and on Instagram. Part of Prelude Talks, an online series celebrating scientific and creative investigation into the determinants of a healthy brain, for Creative Aging International, based in Dublin.